Now it is time for a food entry. As announced by Le Petite Boulanger, this month's "they go really well together" theme is Chocolate and Meat. My attempt is to combine chocolate with jerky. I envisioned something like candied orange peel chocolate strips (one of my favorites). The idea was that jerky, being essentially dried lean meat ought to release more flavor by the extra fat in the chocolate. The saltiness might reduce the bitterness of the covering. Finding beef jerky in Oxford turned out to be surprisingly hard, and I had too look around quite a bit in Stockholm when I visited to find it. I settled for a sweet and hot jerky. I also discovered a mixed reindeer/elk jerky on Arlanda airport that I felt I simply had to try. As for chocolate, I decided on Lindt chili chocolate. Making the chocolate covering was child's play. 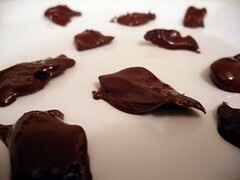 I melted chocolate above a water bath, and dipped jerky pieces. I let them cool off on a plate for a while. The "wild" pieces had an initial sweet and soft chocolate feel as they melted in the mouth, then followed by the chewiness of the jerky. While chewing the meat taste becames dominant but some remaining chocolate tones kept up. I found that I did not entirely like the basic taste of the wild pieces; they had a gamey flavor that I associate too much with the smell of aquarium fish food. It was too dominant for me to enjoy the pieces, although the texture was fine. It took a little while to get to the meat taste in the beef pieces, but it was a very nice transition. There was a gradual transition as I went from licking/melting the chocolate to chewing, from sweet to savoury and finally to hot. As the chili chocolate and meat flavoring interacted they produced a kind of crescendo effect that was very appealing. While interesting, I don't think this simple combination works on its own. It is too tricky to be just a snack, it has to be processed mentally to be enjoyable. The meat taste and the chocolate do go well together. It is a strong, slightly hot and quite savoury tone. The problem is the texture: the yielding chocolate doesn't work together with the fibrous and strong meat. They need to be combined more firmly, likely as part of the jerky preparation process. It looks like I have not been alone in my ideas. Diva Chocolates has developed two jerky flavors. An interesting MindHacks entry on why there is no such thing as internet addiction, based on the paper Online Information, Extreme Communities and Internet Therapy: Is the Internet Good for Our Mental Health? (by Vaughan Bell, Journal of Mental Health, 16 (4), 445-457). His main argument is that "'Internet addiction' researchers conceive of the internet as if it were a set of activities when, in fact, it's a medium for communication." - playing computer games, websurfing and chatting are all bundled together. Second, people often conflate compulsion with behavioral addiction. By applying such loose standards nearly anything can be termed addiction. Instead he suggests looking more careful at what core problems the 'addicted' have - especially social withdrawal, which is both under-researched and far less cool than addiction. But much more plausible as a problem for 10% of the population than a full-blown addiction. I have an entry over at Overcoming Bias about Media Risk Bias Feedback: when there is a public concern about a possible risk, researchers get funding to study it. They report their findings, which are in turn reported to the public through the media. If it looks like a risk, the public will demand more research and funding for fixing the risk. Unfortunately media tends to overreport newsworthy risks, and people tend to notice risks more than non-risks. I calculate under what conditions this could lead to a feedback, where regardless of whether there is any real threat people become convinced there is one. It turns out that if the scientific question is relatively hazy it is surprisingly easy to get this feedback going. In real life there are doubtless even more factors, like people adding ideological dimensions to their risk estimates, vested interests (on both sides) and more feedback loops. But the basic conclusion seems to be robust: misinformation cascades about technical risks (because they are risks, and hence salient and prone to availability biases, and because their technical nature leads to several layers of possibly biased filtering) are not improbable, and that should make us much more sceptical and careful in going to primary sources when we hear the latest scare. Having been to all Transvision conferences save one, I think that I can say with some expertise that Transvision 2007 was the most well-organized conference so far. The location – the Field Museum – was particularly apt: evolution and cultural history under the same roof. There was a strong contingent of entrepreneurs, ranging from Michael Weiner (biotech patents), Martine Rothblatt, Ed Lantz (virtual reality domes), Philip Rosedale (Second Life), Philippe van der Nedervelde (security VR) and Peter Diamandis (space). It is clear that there are ways of doing the transhumanist thing for money. I thought it would have been worthwhile to examine medical entrepreneurship in more detail. It is of vital interest for transhumanism, could bring in money and also enable interesting research and change of current medical practices. Another contingent was the New Agers. While there are always some people with wooey beliefs around the conference, they seemed more noticeable this year. Transhumanism and New Age are memetic neighbours. It is an uneasy relationship with plenty of disagreement on the role of rationality and critical thinking, but there are also a great deal of overlap: both want to enable people to take charge over their own evolution, independently of classical authorities, and explore new realms of experience. My problem about the high level of acceptance of everything in New Age (and too high levels outside too) is that it may slow actual development of enhancements. If customers only have anecdotes and arguments from authority to go on (New Age accepts authorities as long as they say positive things, a tendency I fear we transhumanists also suffer from), they will be subject to strong placebo effects and cognitive dissonance (if it was expensive, it must work better). Cognition enhancers clearly suffer from this, as their subtle effects are magnified and embellished by placebo, and most ”consciousness” devices are far worse. But if people only select enhancements based on subjective efficacy money will not be directed at the enhancements that actually work better. Development will aim at marketing and coolness rather than efficacy. Here we need better consumer information and hardnosed ways of finding what actually works. Another and perhaps strategically important theme was the environment. Ed Begley Jr. did a spiel on it, Michael Ekstract (Verdant magazine) did a very good explanation of the “new green” that is pro-tech and largely (if not completely) at home with transhumanism. I think green transhumanism has a huge potential, but there will be some painful conflicts within the green movement in the future between the anti-progress wing and the pro-environment wing. And transhumanism is unlikely to be the kind of friend who can help much. However, we could definitely do with more innovative environmental thinking or starting to tackle the issues of trans-environments: what makes a good “enhanced” environment? What is the ethics of hybrid technobiospheres? This is where transhumanism might contribute good and unusual ideas. Anybody who thinks transhumanists to be starry-eyed utopians that think everything is going to be great in the future would have had those visions shattered at the conference. Several talks went deeply into threats to human survival and ways of evading them and many questions revolved around misuse of the technologies. Lifeboat Foundation had a strong presence and Philippe van der Nedervelde held a good fire-and-brimstone (or should it be asteroids-and-greygoo?) lecture. I think they are doing some very promising work, but some of their potential approaches need to be evaluated more carefully. For example, pre-emptive screening for dangerous people is unlikely to work effectively and would be an ethical can of worms. The “people’s panopticon” ought to be a major debate in society already, but here technology is creeping up on us and might cause a Dolly affair when suddenly some government (and citizenry) finds itself under informal surveillance. And yes, given the final keynote speakers everybody were either making Star Trek references or talking law of accelerating returns. Overall, Transvision has gone far, far beyond a bunch of people in a cellar in Weesp, just outside of Amsterdam. The sheer weight and credibility of the speakers was amazing. But the problem is to decide what the conference is for: is it a meeting place for transhumanists? A way of bringing it to the public? To investors and policymakers? To media? An academic conference? Or a mixture of all of the above? I think we have reached the point where we simply cannot try the last possibility, we have to specialise the conference more and more. This means losing some people, but it might improve it even further. Chicago 2007 was a great step upward, now we need to make further steps outward. Maybe the next Transvision will be a set of different conferences? 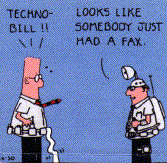 When is it Rational to Get a Technology? A discussion on the Swedish transhumanist mailing list Omega got me thinking about this problem: when is it rational to start using a new technology? If you buy it as soon as it arrives you have no information on whether it is worth it, but waiting for a long time means you might miss something good. 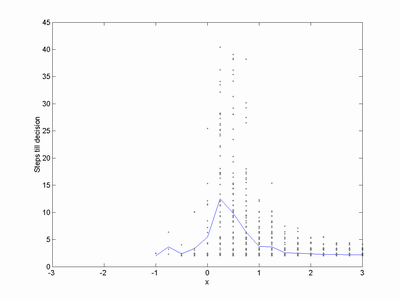 which is another normal distribution with mean μ = ∑iyi/(N+σ22/σ12). 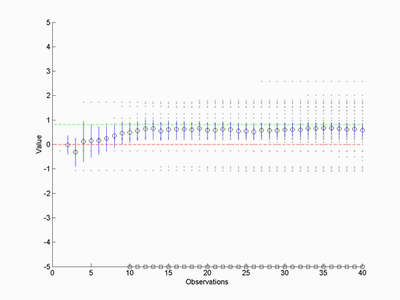 Now we can evaluate the expected value of x based on the observations and see if it is positive enough. However, we want a robust estimate of whether it is worthwhile to get the technology or not. But since we know the posterior distribution we can calculate a 95% confidence interval. We know the "true" value will be inside this interval, and once the entire interval is above a certain limit we get the technology. Of course, we do not really know σ22, but calculating the standard deviation of the y's works decently. We can assume we know σ12 (and that f(x) is normal) by experience. In practice changing σ12 doesn't have an enormous effect beyond making our estimates more or less conservative. Here is a simulation. The green line represents the true value of x, the grey dots represent evaluations arriving over time (both assumed to have variance 1 and zero means). The red line is the decision boundary (is the technology positive or not?) and the blue lines are confidence intervals. The squares mark times when the confidence interval is completely above the decision boundary, i.e. there is just 5% chance that x is negative. In this case it would be sensible to get the gadget at time 10. How reliable is this kind of estimate? Sometimes I get isolated 'go'-signals as the early estimates jump around, and occasionally false positives happen. Overall it seems to be pretyt robust, with indeed errors happening less than 5% of the time. One can play safe of course by making sure the interval is above the decision boundary two or more consecutive timesteps to insure there are no flukes. The time it takes to reach a decision is surprisingly short. For very good gadgets (x>2) the average time is about 2-3 steps. It becomes harder to choose close to neutrality, where convergence may take many tens of steps. Still, even here it is not uncommon for rapid decisions to happen. Erroneous decisions (for negative x) also happen quickly: these are driven by the estimates jumping around randomly at the start, accidentally ending up on the wrong side of the decision boundary. So the conclusion is: if a few of your friends are very enthusiastic (i.e. beyond twice their normal standard deviation) then it is a good chance that the new gadget is worthwhile. Otherwise, wait until you get much more people to weigh in. In reality, things are likely not normally distributed but have some skew distribution, and people are clearly not independent in their judgements. Skew distributions are relatively easy to add to this framework while dependent estimates would require more footwork. But all in all, you don't seem to need an enormous crowd to get some wisdom out of it. "As more is learned about how our bodies work, more options become available for altering those workings. To date, most of this alteration has sought to restore function to some sort of baseline. But it is also possible to enhance various functions into the supernormal realm, and the options for this are set to grow ever greater. The fact that such endeavours will carry risks should not be trivialized. But adults should be allowed to take risks, and experience suggests that they will do so when the benefits on offer are enticing enough. By the end of this century the unenhanced body or mind may well be vanishingly rare. As this change takes place, we will have to re-examine what we expect of athletes. If spectators are seeking to reset their body mass index through pharmacology, or taking pills that enhance their memory, is it really reasonable that athletes should make do with bodies that have not seen such benefits? The more the public comes to live with the mixed and risk-related benefits of enhancement, the more it will appreciate that allowing such changes need not rob sport of its drama, nor athletes of their need for skill, training, character and dedication." "To change the rules on pharmacological enhancement would not be without precedent. It was once thought that a woman could not epitomize the athletic ideal as a man could, and so should be stopped from trying. Similarly, it was thought proper to keep all payments from some athletes, thus privileging the already wealthy. These prejudices have been left behind, and the rules have changed. As pharmacological enhancement becomes everyday, views of bodily enhancement may evolve sufficiently for sporting rules to change on that, too." Maybe our current anti-doping rules ought to be regarded as anti-transhuman prejudice? While there are a rational side to reducing doping (risk, fairness) there is also a dark undercurrent of dislike of the "artificial", of people modifying their own bodies and trying to become something more. Pharyngula: Desecration: it's a fun hobby! discusses how to best desecrate a Quran in the privacy of one's own home as a form of protest against irrational hate crime laws. 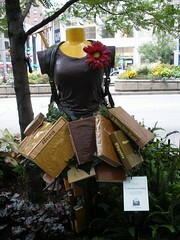 However, destroying books is IMHO deeply wrong. And traditional modes of desecration have too much of the stink of intentionally making somebody who likes a particular symbol feel bad. So what about a more constructive form of desecration, to play with the information itself? I think indeed "overwrought sanctimony must be met with disrespectful insolence". One might respect something and yet play with it. It is when play and respect become mutually impossible one has lost one's humanity. And this is especially true for textual literalists. I hacked together a small Markov chain program that constructs a new medley text out of another, based on its statistics. Then I fed it the first chapters of the Quran, Genesis (to annoy Christians and Jews), OT III (to annoy Scientologists) and finally Ingersoll's The Improved Man (to give atheists and agnostics like myself a boot too - I like his writings). That is insolence to about 5 religions at the same time. "The Improved Man will be a king over you. And give women their dowries as appointed;"
"And Judah took a garment, and laid by her vail from her, and give it (their own) interpretation. But none knows its interpretation except Allah, and who fought and were slain, I will speak: peradventure there shall thirty be found on all thetans." "And God said, Let there be postponement until (he is in) ease; and that you lay down your arms, and take witnesses from among the good things which Allah has enjoined you with unbelief and for the bombing, transport to Teegeeack (Earth) and put me into the ark, and it is that of which he hath to my father's house: Then shalt thou go, and I was a cunning hunter, a man as I love, and bring you as a Protector." "For their riches were more than Leah, and the Atlantic area ones to Las Palmas and there is no blame on you and you should enter the garden of palms and vines with streams flowing beneath it; he has in it all kinds of fruits; and give full measure and weight and do not find a way for them. These are the inmates of the worlds." Of course, the most constructive insult possible to fundamentalism is textual analysis, putting the text into its historical framework just like has already been done with the Bible. Hmm, it might actually be fun writing some software to do automatic text analysis of various holy scriptures, figuring out where they are imitating each other. But that is for another evening. The challenge in the They Go Really Well Together #2 challenge was to combine banana and parsley. I didn't have the time to do anything in time for the finishing date, but the combination came up yesterday during a dinner. 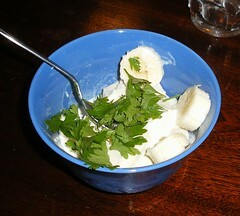 So we tried an ultra-simple dessert: vanilla ice cream, banana and parsley. Indeed, they went well together. The parsley adds freshness to the milder banana taste, and together with the icecream produces a very nice flavor reminiscent of green tea icecream. Parsley might go well in some fruit salads. I also experimented with parsley and raspberries, but the taste was too "crowded". Parsley and dark chocolate provided a wonderful initial taste explosion, but the chocolate almost immediately overpowered the parsley. Overall, parsley contains some interesting compounds that might be both tasty, cause diuresis and photosensitivity. The fun folklore surrounding it makes a great dinner discussion.